Cardfight Pro: Card Gamer Vol. 40 promos "Fierce Leader, Zachary" and "Mimori Suzuko"
Card Gamer Vol. 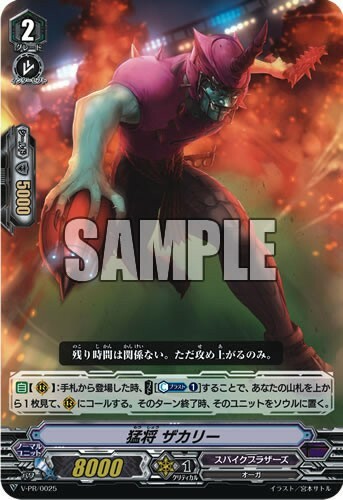 40 promos "Fierce Leader, Zachary" and "Mimori Suzuko"
AUTO [Rearguard Circle]: When placed from your hand, [Cost: Counterblast 1] look at 1 card from the top of your deck, call it to a Rearguard Circle, and at the end of this turn, put that unit into your soul. 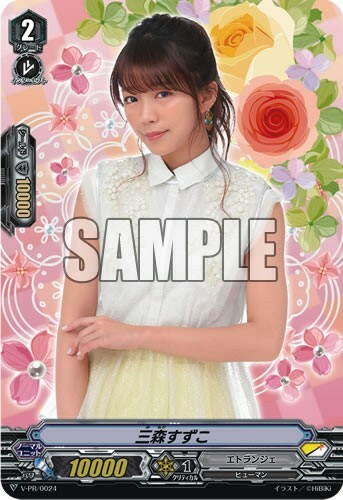 An Etranger card based on Mimori Suzuko, voice of Tatsunagi Kourin in the Cardfight!! Vanguard anime. To be included in volume 40 of Card Gamer magazine.